BGA TIMING CHAIN KIT TC6322FK. NAVARA NP300 2,5 DCI D40. Pathfinder 2.5 R51 03/05-12/10. We are also not responsible for installation errors, labor expenses, or any other expenses that may occur. This is an original quality part manufactured by FAI. Multiple choices exist for:NISSAN PATHFINDER 2.5 Timing Chain Kit. FOR NISSAN PATHFINDER. Part specifications. Vehicle compatibility. PART CHOICE ALERT. Navara (D22). Navara (D40). Pick-up (D40). Pathfinder (R51). Complete with Gears. Timing Chain Kit. 2 x Camshaft Gears. 2 x Bright Link Duplex Timing Chains. Cabstar 2.5 (2007-2014) 01/07-04/12. NAVARA NP300 2,5 DCI D40. FAI TIMING CHAIN KIT TCK42CRD-10. Pathfinder 2.5 R51 03/05-12/10. We are also not responsible for installation errors, labor expenses, or any other expenses that may occur. Function Timing Chain. Chain Type Simplex; Closed chain. NISSAN 130282Y000, 1302831U00. NISSAN CEFIRO III Saloon (A33) 2.0 Saloon Petrol 01/2000 09/2003 FWD 24 140 103. NISSAN CEFIRO III Saloon (A33) 3.0 Saloon Petrol 01/2000 09/2003 FWD 24 200 147. NAVARA NP300 2,5 DCI D40. FAI TIMING CHAIN KIT TCK42-06. Pathfinder 2.5 R51 03/05-12/10. We are also not responsible for installation errors, labor expenses, or any other expenses that may occur. (4) TOP ENGINE GEARS X 2. 1) ENGINE TIMING CHAIN X 2. 3) TIMING GUIDE RAILS X 4. 2) ENGINE TIMING TENSIONER X 2. KIT CONTAINS We will work to resolve any issues and assist in anyway that we can. You are obliged to take reasonable care of the item. (2) ENGINE TIMING TENSIONER X 2. 4) TOP ENGINE GEARS X 2. 1) ENGINE TIMING CHAIN X 2. 3) TIMING GUIDE RAILS X 4. KIT CONTAINS We will work to resolve any issues and assist in anyway that we can. You are obliged to take reasonable care of the item. Multiple choices exist for:NISSAN PATHFINDER 2.5 Power Steering Belt. FOR NISSAN PATHFINDER. Part specifications. Vehicle compatibility. This is an original quality part manufactured by Blue Print. 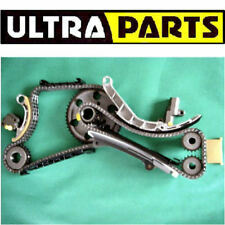 TIMING CHAIN KIT NISSAN PATHFINDER III (R51) 2.5 dCi 4WD (YD25DDTi) 03/05-08/06 FAI Auto Parts TCK42CRD. NISSAN PATHFINDER III (R51) 2.5 dCi 4WD (YD25DDTi) 03/05-08/06. Car Care & Accessories. (Reference TK68). Navara (D22). Navara (D40). Pick-up (D40). Pathfinder (R51). Timing Chain Kit. 2 x Bright Link Duplex Timing Chains. 5 x Guide Rails. Multiple choices exist for:NISSAN PATHFINDER 2.5 Alternator Air Con Belt. FOR NISSAN PATHFINDER. PART CHOICE ALERT. Part specifications. This is an original quality part manufactured by Blue Print. FOR NISSAN PATHFINDER. Part specifications. This is an original quality part manufactured by Blue Print. Number Of Ribs:7. Vehicle compatibility. FAI TIMING CHAIN KIT TCK42. NAVARA NP300 2,5 DCI D40. Pathfinder 2.5 R51 03/05-12/10. We are also not responsible for installation errors, labor expenses, or any other expenses that may occur. Engine Code: YD25DDTI; Model year from: 06/2008; Model year to: 01/2008; Fitting Position: Upper; or; Engine Code: YD25DDTI; Fitting Position: Upper. CALIBER KCC061, KCC240. Function Timing Chain. Chain Type Duplex; Closed chain. Iwis applies the exceptional, specially developed coating process to achieve improved resistance to aggressive oil-carbon-fuel mixtures. Using a full synthetic oil may help to reduce oil consumption if a mineral or semi-synthetic oil is being used. In aninterference engine the timing belt or chain is also critical to preventing the piston from striking the valves. A timing belt is a belt that usually features teeth on the inside surface, while a timing chain is a roller chain. Navara (D40). Ultra Parts Ltd's TK78A chain kit is a full conversion to duplex and an upgraded vacuum pump driveshaft, bearing & idler sprocket. Chains in our YD kits are genuine. 2 x O.E Bright Link Duplex Timing Chains. Multiple choices exist for:NISSAN PATHFINDER 2.5 Alternator Air Con Belt. FOR NISSAN PATHFINDER. PART CHOICE ALERT. Part specifications. This is an original quality part manufactured by Blue Print. Vehicle compatibility. Is your vehicle leaking engine oil?. Having to top up oil often?. chemicals to stop oil leaks from the seals by restoring to its original size. Simply add contents of can to engine oil and drive as normal. FAI TIMING CHAIN KIT TCK42L. NAVARA NP300 2,5 DCI D40. Pathfinder 2.5 R51 03/05-12/10. We are also not responsible for installation errors, labor expenses, or any other expenses that may occur. Timing Chain ADN17320 Blue Print. Part Number ADN17320. NISSAN 13028AD211, 13028AD212, 13028AW410. CALIBER KCC061, KCC240. Function Timing Chain. Chain Type Duplex; Closed chain. Number of Chain Links 92. 2 Year Warranty FAI Timing Chain Kit. FAI OE PRODUCTS. APEC BRAKE DISC & PADS KIT. BLUE PRINT TIMING BELT KIT. PATHFINDER YD25DDTi III (R51) 2.5 dCi. CONTITECH TIMING BELT. GATES TIMING BELT KIT. APEC BRAKE CALIPER. FAI Autoparts are the professional choice for premium automotive components. FAI Timing Chain Kit. Search “FAI Autoparts catalogue”. FAI: TCK42CRD-10, ASHIKA: KCK112, KCK113, JAPANPARTS: KDK-112, KDK-113, JAPKO: KJK112, KJK113, NISSAN: 13028-EB70A, 13028-EB70B. Colour Coding Yellow. of chain links 92. Chain Type Duplex. If the item is used, we are unable to accept the goods back. IN DOUBT WHETHER IT WILL FIT?. MAINLAND -24 HRS. (incl: NORWAY & SWITZERLAND). Spec Note: (24 Valve) Eng. Code "VQ40DE" -Gears and Sprockets are NOT included. 12 - 15 for Nissan NV1500 4.0L 3954CC V6 DOHC. 05 - 15 for Nissan FRONTIER 4.0L 3954CC V6 DOHC. 05 - 15 for Nissan XTERRA 4.0L 3954CC V6 DOHC. 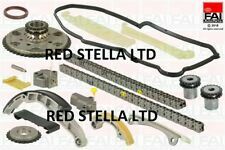 INA TIMING CHAIN COMPLETE KIT - 559011710. Part Number: 559011710. (We can mark the item as a 'gift' if requested to, but we will not declare any different amount). Toys & Gifts. Car Accessories. Part Number: 100389. Febi Bilstein are a German manufacturer of a wide range of vehicle parts including brake discs, engine mountings, stabiliser links, timing chain kits and wishbone bushes. The range is now greater than 34,000 parts and each part is either equal to or greater quality than the original part. FAI Autoparts are the professional choice for premium automotive components. FAI Timing Chain Kit. Search “FAI Autoparts catalogue”. Chain Type: Roller Chain. Chain Type: Simplex. Chain Type: Duplex. PART NUMBER: TCK42CRD. ENGINE CODE: YD25. NISSAN NAVARA/PATHFINDER/NP300 NAVARA 2.5 dCi ENGINES. TIMING CHAIN KIT. SUITED FOR. NP300 NAVARA YD25DDTi (D40) 2.5 dCi. 2 Year Warranty FAI Timing Chain Kit. FAI OE PRODUCTS. APEC BRAKE DISC & PADS KIT. BLUE PRINT TIMING BELT KIT. CONTITECH TIMING BELT. GATES TIMING BELT KIT. APEC BRAKE CALIPER. Vehicle compatibility information is provided as a guide only by supplier. Then at our discretion we will decide the next course of action. Be aware that each model of vehicle may have a choice of few different part options. Nissan 13028EB300, 13028-EB30A, 13028-AD212. Chain Type Roller Chain. Chain Type Simplex. Chain Type Duplex. The professional choice for premium automotive components! Vehicle list is for general guidance only. NISSAN NP300 NAVARA (D40) 2.5 dCi 07-2005 -. NISSAN NP300 NAVARA (D40) 2.5 dCi 4WD 07-2005 -. NISSAN NP300 NAVARA (D40) 2.5 dCi 4WD 10-2006 -. NISSAN PATHFINDER III (R51) 2.5 dCi 4WD 03-2005 -. 2488 106 144 YD25DDTi Pickup.